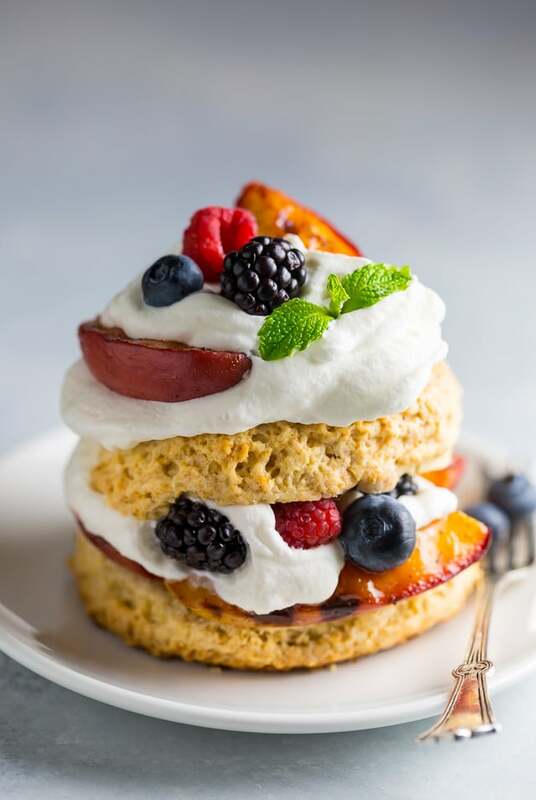 Grilled Peach and Mixed Berry Shortcakes are the ULTIMATE Summer dessert! Because when it comes to shortcakes… why should we limit ourselves to just strawberry?! Answer: We shouldn’t! This recipe makes exactly 4 shortcakes. If you’d like to double it, you’ll need to make two separate batches of biscuit dough. For your convenience, the biscuit dough may be made in advance, shaped as directed, and frozen until needed. You may need to add a minute or two to the baking time, when baking from a frozen form. COLD BUTTER is essential when it comes to biscuit making! I suggest placing your butter in the freezer for a few minutes before you cut it up. Cold butter = flaky biscuits. Which is what we want, of course! Your peaches should be firm but ripe. Hard peaches as well as super ripe peaches do not grill well. For the grilled peaches you may use an outdoor grill, or an indoor grill. I used this one and loved it. I highly suggest using fresh whipped cream! My recipe below is a classic and tastes SO much better than the store bought stuff! Use the freshest Summer berries you can get your hands on! This ensures they’re sweet and juicy. 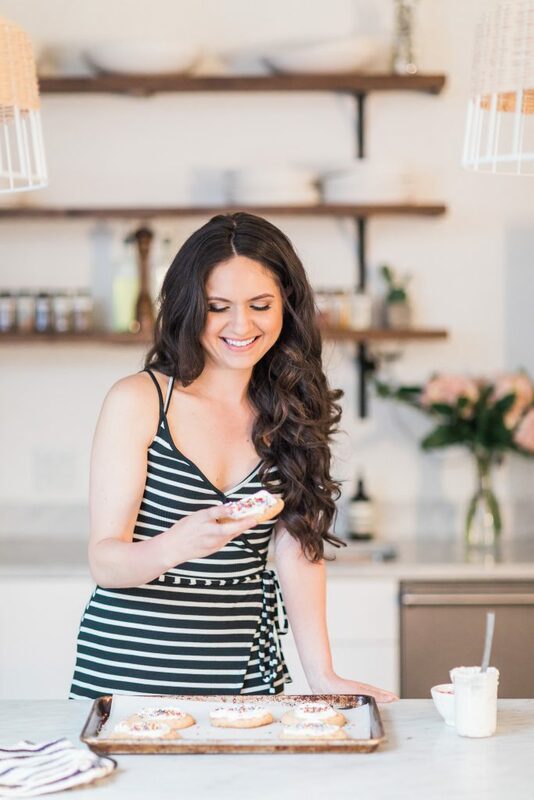 I hope you LOVE this Summery dessert as much as I do! It’s crunchy, creamy, juicy, fruity, and just downright delicious. 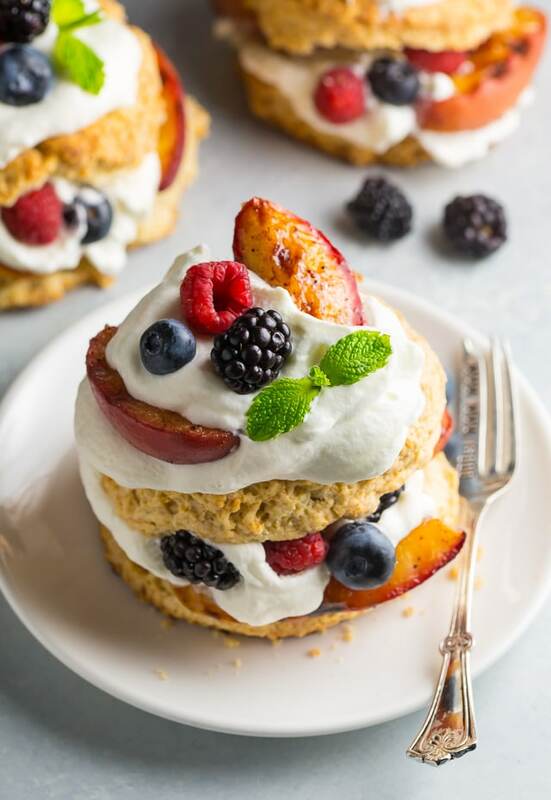 These Grilled Peach and Mixed Berry Shortcakes are the ULTIMATE Summer dessert! A fresh dollop of whipped cream put them over the top. Preheat oven to 400°(F). Line a large baking sheet with parchment paper; set aside. In a large bowl combine flour, salt, baking powder, baking soda, and sugar; mix well to combine. Cut the butter into small cubes then work it into the mixture (using your fingers, two forks, or a pastry cutter) until lit resembles a coarse meal. In a small bowl whisk together the egg, milk, and cream. Add to flour/butter mixture and use a fork to stir everything together until just moistened. Empty the loose dough out onto a clean, lightly floured work surface and gently knead it into a workable texture. About 5 or 6 kneads should bring it together. Gently pat the dough until it's evenly 1 and 1/2 inches thick. Use a 3" biscuit cutter to cut out 4 rounds. Carefully transfer biscuits to the prepared sheet, placing them 2" apart. 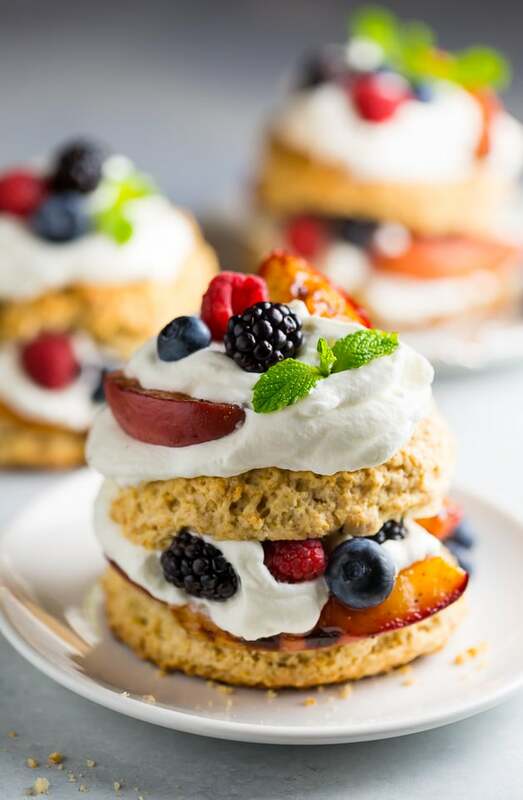 Lightly brush the top of each biscuit with cream. Bake for 18 to 20 minutes, or until golden brown. Allow biscuits to cool for 10 minutes on the baking sheet. Heat grill to medium-high heat. 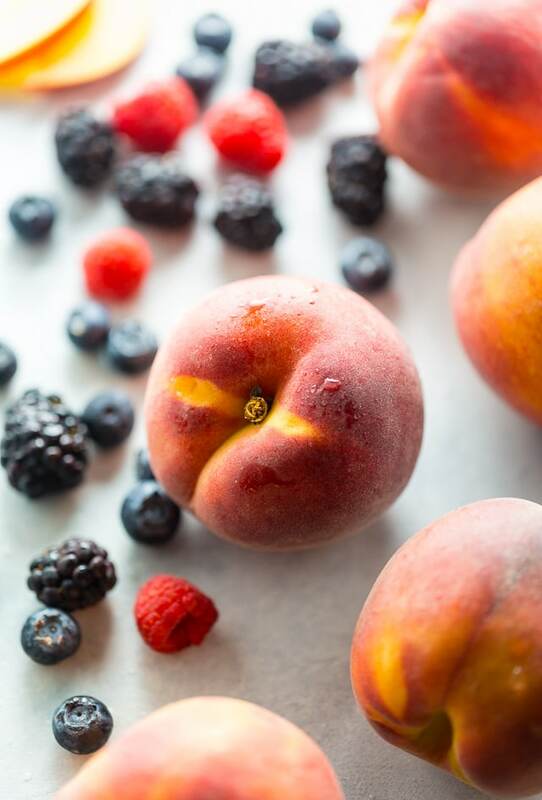 Gently brush the peach wedges with a little canola oil and place them on the grill for 4 minutes; gently flip the peaches over and continue to cook for 3-4 minutes, or until grill marks appear and the peaches have begun to caramelize. Carefully remove from the grill and set aside until needed. 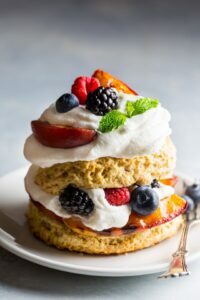 In a large bowl using a handheld mixer, or in the bowl of a stand mixer fitted with the whisk attachment, beat together the heavy cream and confectioners' sugar until soft peaks are formed. Set aside - or refrigerate - until needed. 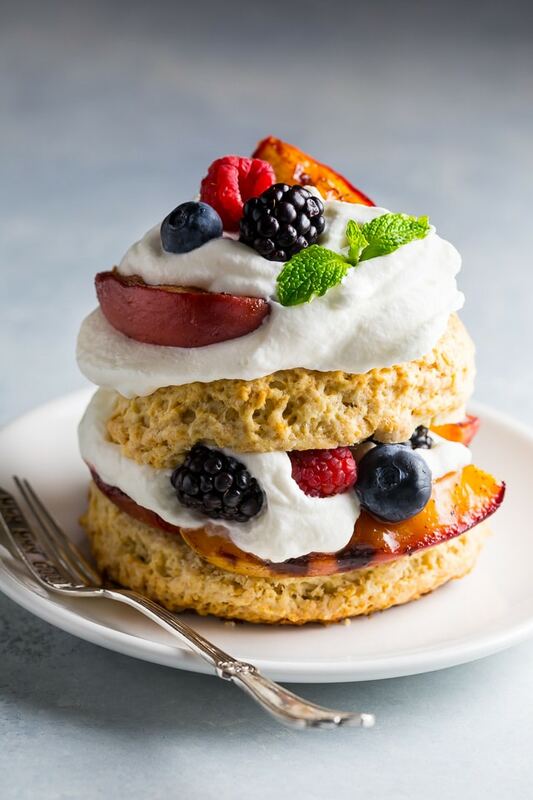 Slice the biscuits in half and layer with whipped cream, grilled peach slices, and mixed berries. 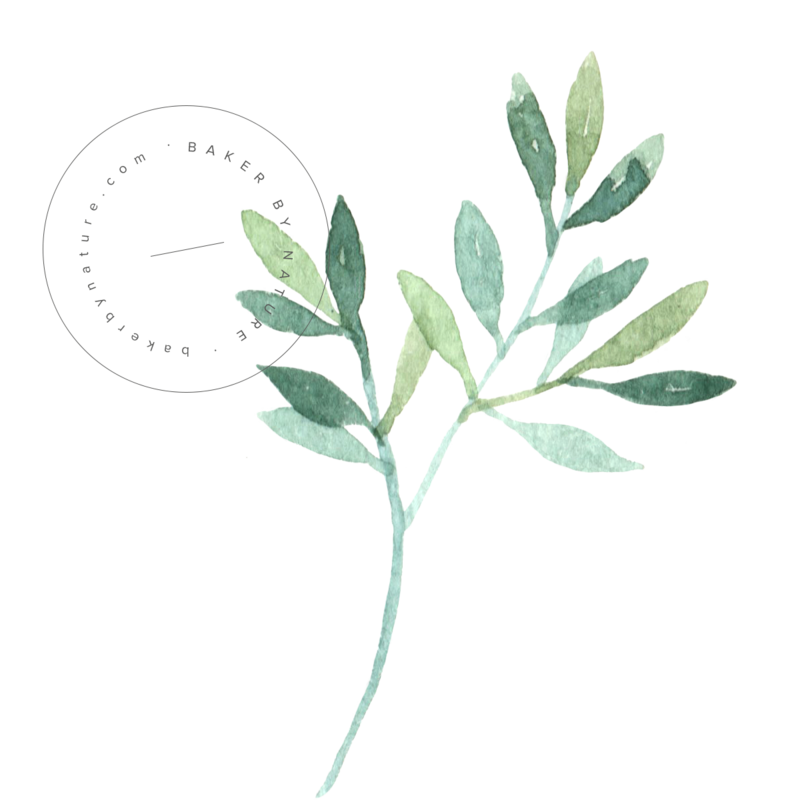 Garnish with mint springs, if desired. Serve at once! You can make the biscuits up to 2 days in advance and store them in an airtight container at room temperature, or freeze them for up to 2 months. Thaw biscuits completely before using. You may also freeze the biscuit dough rounds for up to 2 months. You may need to add a few extra minutes to the bake time when baking from a frozen state. Be sure your butter is VERY cold before adding it to the biscuit dough. Cold flour also helps create flakier biscuits. If you don't have buttermilk on hand, you can make your own version using regular milk and lemon juice. Simply add 2 teaspoons of fresh lemon juice to a liquid measuring cup, then add whole milk until it reaches 1 cup. Give it a stir, and set it aside for 5 minutes. Viola! Now you have buttermilk to use in this recipe.